When it comes to creative writing many young people struggle with where to start and do not have much interest in writing for pleasure. The writing workshops I deliver focus on using new technologies to spark their interest. Online media can be used very effectively to work on different aspects of the curriculum, writing blogs for writing for an audience for example. I can tailor my workshops to your requirements so that you are sure of getting the necessary outcomes from the day. I work with students of all ages, from primary to secondary school pupils and a range of websites may be used during the day including word cloud generators, and many others. Working with groups of up to 20 students from primary age to KS3 these workshops use websites to encourage young people to think creatively and enjoy writing their own stories, whether just for school use or to be seen by a wider audience. Wordclouds used as a starter activity and story starter websites, blogs and picture book creators are used for story development. 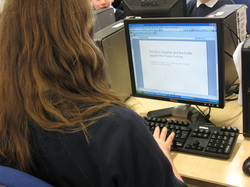 Accounts set up for the school with sites used so that they can be used after the day by other students. Websites used are free or low cost and students will need access to a computer or laptop with an internet connection. The Write Path is an international collaborative writing project that involves students all over the world continuing and completing stories or poems that have been started by published children’s authors and poets (http://writepath.ning.com/page/general-information). This day is a mini version of this run in one school or over a group of schools – story starters are placed on the blog in the morning and each class of children have to work together to put a next paragraph onto each of the stories within their lesson time. At the end of the day books can be published with the finished stories. "The day was thoroughly enjoyable and it was a great way to get our new Year 7 students engaged and excited about English from their first day. It was a huge success because students from all abilities were able to demonstrate their skills and get involved with writing exciting, innovative and creative stories. I highly recommend it!"